Kelly Northey, Owner of Australian company Bamboo Bubby, came to know of EczemaBlues.com and introduced MarcieMom to its Bamboo Bubby BagTM – a sleeping bag that is made from a blend of cotton and bamboo with an Adjust-a-SleeveTM design. Bamboo Bubby BagTM is created to reduce damage from scratching at night, so that the whole family can have a good night’s sleep. MarcieMom, as always, does not do product review but is open to finding out more about products for children with eczema. In this interview, Kelly answers questions about Bamboo Bubby BagTM, including its material, design and benefit to eczema babies. Marcie Mom: Thank you Kelly for taking time for this interview. I’m happy to know you, a mom who has built a business from finding a solution to your son’s eczema. I read from your site that you have designed Bamboo Bubby Bag at a time when your son has outgrown sleepsuits with handcovers. This, I’m sure many parents, myself included, can relate. It’s indeed the toughest period because the child can’t be swaddled safely but can roll and scratch. Can you share a little about your background? For instance, did your healthcare industry background help or do you like sewing and why have you decided to make your own sleeping bag? Kelly: I think both of these things have helped in the conception of the Bamboo Bubby Bag. I work in the healthcare industry but with a focus on research and information technology roles, so when I noticed a real gap in the market here for a product to solve my baby’s problems, I definitely utilised my research skills when trying to find a solution to our problem and while I do have some sewing skills, I haven’t actually practiced them properly for a long time, so I am grateful for the assistance of my sister-in-law for her expertise when it came to sewing the first lot of prototype Bamboo Bubby Bags. However deciding to launch my business as a predominantly online one has definitely been the best use of my previous skills in information technology systems and website design and I love everything about the world of online marketing and social media as a means of sharing information and helping each other and when I realised there was no other product quite like it on the market, I knew I had to get Bamboo Bubby Bags out there in the world to help as many others who are struggling with sleeplessness caused by eczema. Marcie Mom: Your Bamboo Bubby Bag is made from 70% bamboo and 30% organic cotton interlock fabric. From your site, I understand the bamboo has anti-bacterial properties, not likely to irritate baby’s skin and able to expand when warm (for baby to be kept cool) and contract when cold (for additional warmth). You also offer a free fabric sample here. Do all bamboo have the same anti-bacterial properties and texture and which type of bamboo is used in your Bamboo Bubby Bag? Your site mentions ‘natural’, can you explain to us your definition of natural? Kelly: Bamboo naturally contains anti-bacterial and bacteriostatic bio-agent called “Bamboo Kun”, which allows it to naturally flourish and grow in the wild without the use of pesticides or fertilizers. There have been some studies undertaken in whether or not this anti-bacterial benefit remains when bamboo is manufactured into fabric. The Japan Textile Inspection Association (JTIA) completed a study that claims that even after 50 industrial washes, bamboo sheets showed a 70% effectiveness of antibacterial properties. The China Industrial Testing Center completed a similar study, where bamboo fabric was tested over a 24 hour incubation period with the bacterial strain Staphylococcus aureous. Their results showed after a 24 hour period, the 100% bamboo fabric showed a 99.8% kill rate. These reports suggest bamboo may be an ideal fabric to use on eczema skin which is often inflamed and even infected. MarcieMom: It is mentioned on your site that bamboo has the property to remove excessive moisture. Can you explain to us how this works? Also, why is the decision to have it 70% bamboo, in other words, is 70% proven to give the optimal properties – thermal regulating, anti-bacterial, softness, durability? Kelly: The scientific term for the ability to remove excessive moisture is the capillary effect or wicking effect and research shows that of the five leading fabrics available on the market, bamboo has the highest capillary effect, absorbing more moisture and drawing it away from the body than other fabrics and also decreasing the level of abrasion and damage to sensitive skin. When skin becomes sweaty, fabric used to cover it causes the level of abrasion to increase, which then worsens skin conditions like eczema and is especially harsh on the delicate skin of babies with eczema. This is why synthetic fabrics which do not let the skin ‘breathe’ are notoriously bad for eczema skin. So therefore, Bamboo fabric is the softest and least abrasive fabric to delicate skin, due to its ability to pull moisture away from the body. When compared to other ‘breathable’ fabrics such as cotton and viscose rayon, bamboo is superior due to the spaces between the individual fabric fibres, allowing greater moisture absorption while at the same time allowing more air ventilation through the fabric. Deciding upon the best type of bamboo fabric to manufacture the Bamboo Bubby Bags from was difficult. 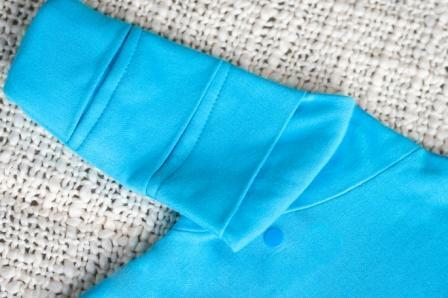 100% bamboo fabrics are beautifully soft and silky, but this softness also seemed to wear quicker and for a sleeping bag that will last throughout a baby’s entire first 2 or more years we needed an element of durability to the fabric. So a 70% bamboo/30% organic cotton mix interlock fabric was the best option. Still plenty of softness, but with added strength of organic cotton to help maintain its shape and be able to outlast a baby’s first couple of years. Marcie Mom: Your Bamboo Bubby Bag has unique design features, such as Adjust-a-Sleeve design and double-ended zipper. Apart from allowing the baby to use up till 2 year-old, it can also help to make night changes easier. Given that the design is meant for the sleeping bag to ‘grow’ with the baby, how many machine washes can it withstand? Can it be washed in 600C cycle to remove dust mites? Kelly: Bamboo fabrics will maintain their special qualities when washed in cold to warm water (up to 60 degrees Celsius) on a gentle-normal cycle with a gentle detergent, free of bleach. Line dying is best, however when necessary they can also be dried in clothes dryer on the cool setting. I have Bamboo Bubby Bags here that have been washed regularly like this for more than 18 months now! Marcie Mom: One last question – for parents who want to try out bamboo clothing or sleeping bags, what would you recommend them to look out for before making the purchase? For instance, the source of bamboo or any certification? Kelly: Yes, definitely check that any bamboo fabric products you purchase meet the Oeko-Tex 100 Class 1 testing standard which means that it is free from harmful substances, manufactured to cause the least possible harm to the environment and safe to use for baby products. MarcieMom: On a personal note, how did you juggle your business, family and childcare? Kelly: We had to change a lot of things about our working life to make it more flexible and to suit our particular family needs. We have both in the past year changed jobs and I’m now more easily able to also juggle the Bamboo Bubby business I have built steadily over this time as well alongside everything else. I’m now quite proud of the fact that I started the entire Bamboo Bubby business as a way to give my mind something positive to focus on in the few hours every evening when we would anxiously await the next midnight wake up, knowing that our baby just never really slept until after this time. I hope it can now help others and give them also a place of support during a really distressing time. On hindsight now too, I’m also very glad that my now toddler has had such great experiences at childcare. It has been great for him in every possible way and he’s made some wonderful little friends. Much as I have struggled with the ‘return to work juggle’, I would say to anyone who is contemplating childcare that just because your child may have some special needs, if you feel in your gut that the place is right and that they can look after your child according to management plans then the benefits for your child overall do outweigh any of the mummy-guilt that we naturally place on ourselves! Marcie Mom: Thank you Kelly so much for answering my questions. It’s great to see your business flourishing and being awarded to be part of the Young Australian Entrepreneur scheme. p.s. to readers of eczemablues.com, I didn’t receive any money from Bamboo Bubby or Kelly for this interview.